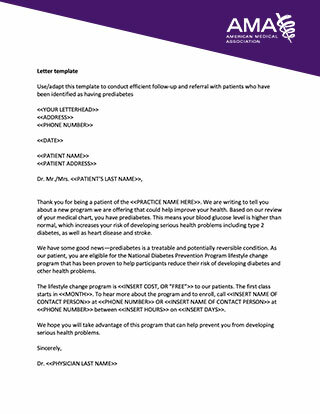 Access a variety of fact sheets, questionnaires and handouts that provide guidance on engaging health care teams and stakeholders on diabetes prevention topics, from testing and screening, to National DPP lifestyle change programs, including referrals and implementation. 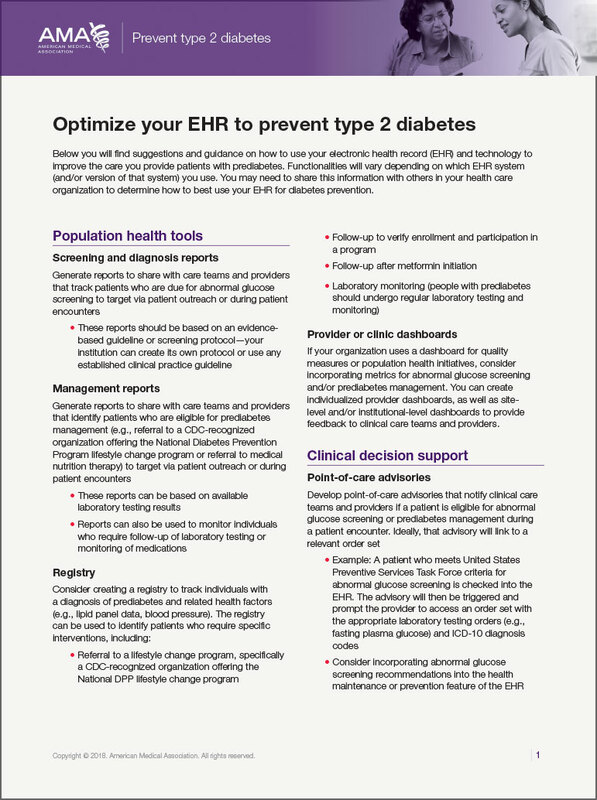 This document provides guidance and suggestions on how to use your electronic health record (EHR) to identify and manage patients at risk for type 2 diabetes. This tool helps you estimate the health and economic benefits of offering the National DPP lifestyle change program to your population. 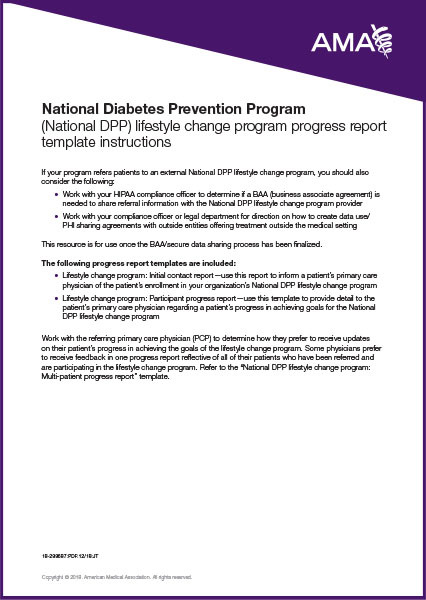 Use this Impact Toolkit to project the health and economic effects of the National DPP lifestyle change program on your population at risk for diabetes. 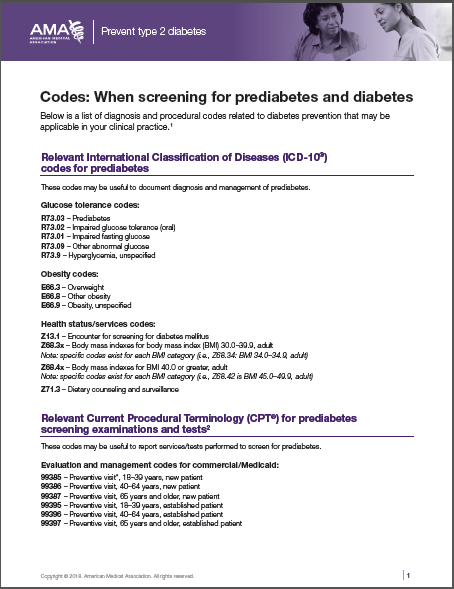 This document outlines some of the relevant ICD-10 and CPT codes for diabetes prevention that can used by physicians to document diagnoses in the medical record and for billing. Engaging physicians and care teams is essential for creating a successful diabetes prevention strategy. This resource offers tips for facilitating impactful events, including webinars, lunch and learns and in-person presentations. The AMA is in the process of developing additional resources to support your physician engagement activities. If you need additional assistance, please click here and one of our subject matter experts will assist you. To be used if referring patients to an external lifestyle change program. 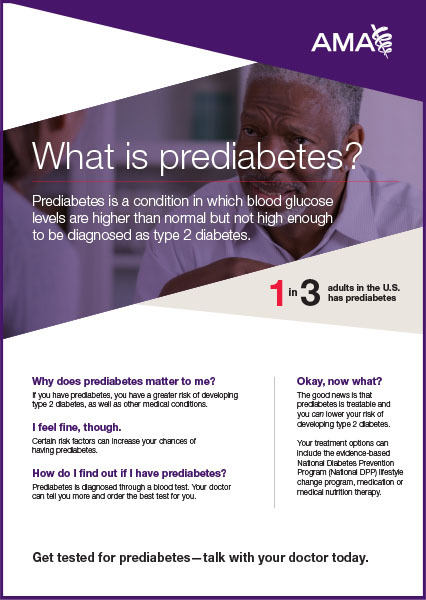 This resource can be used to conduct efficient follow-up and referral with patients who have been identified as having prediabetes. 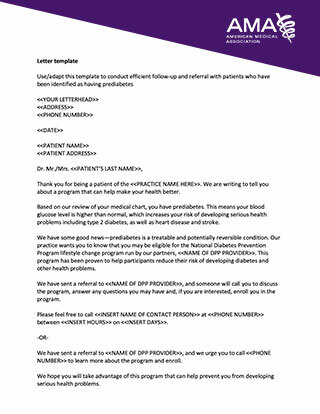 With the addition of your company letterhead, contact information and patient personalization, the scripts can be customized per your organization’s specific needs. To be used if offering the lifestyle change program internally. This resource can be used to conduct efficient follow-up and referral with patients who have been identified as having prediabetes. With the addition of your company letterhead, contact information and patient personalization, the scripts can be customized per your organization’s specific needs. 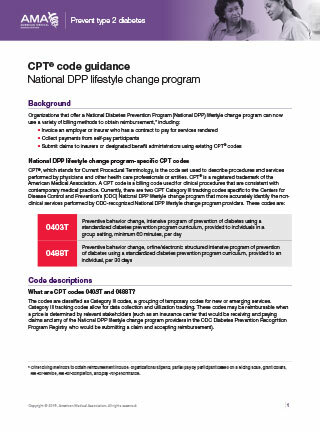 This document provides insight on billing methods and CPT® (Current Procedural Terminology) codes for organizations that offer a National Diabetes Prevention Program lifestyle change program, which can be used for billing, claims, or reporting purposes by key stakeholders. Frequently asked questions regarding CPT® codes are also addressed. 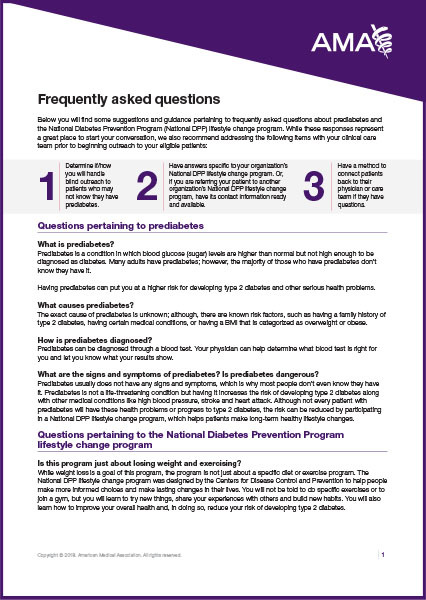 This FAQ addresses commonly asked questions regarding prediabetes and the National Diabetes Prevention Program (National DPP) lifestyle change program. It can be printed and utilized by your clinical care team as a training tool to properly answer patient questions. 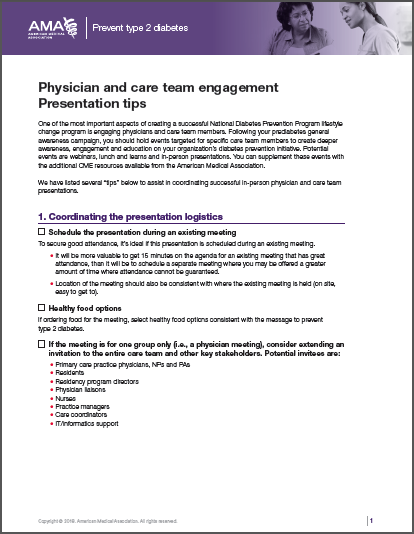 These progress report templates can be utilized to inform a patient’s primary care physician of their enrollment in your organization’s lifestyle change program, including their progress in achieving program goals. So You Have Prediabetes – Now What? 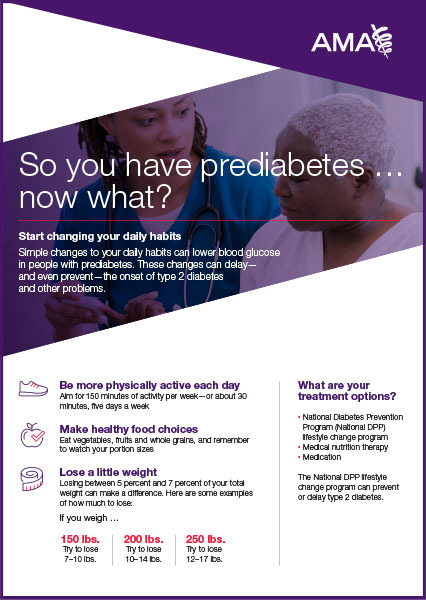 This resource shares information about prediabetes for diagnosed patients and highlights treatment options including the National DPP lifestyle change program. Color printing is recommended. 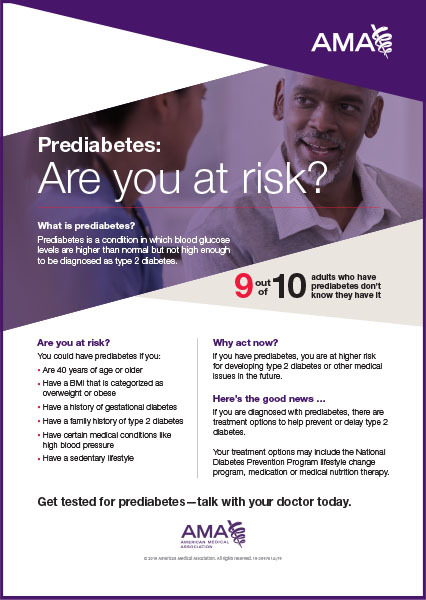 This handout sheds light on the prevalence of prediabetes and associated risk factors for patients. Color printing is recommended. 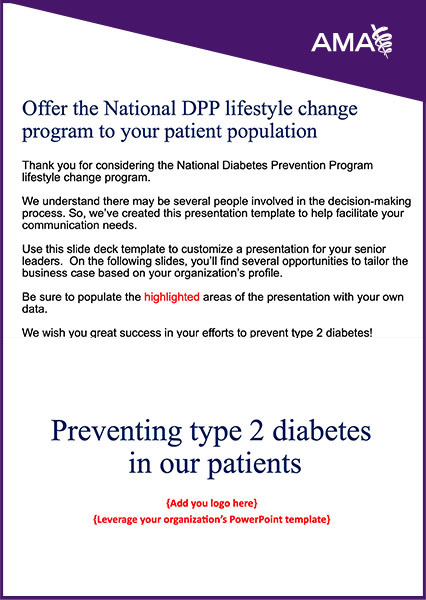 This resource raises awareness about prediabetes for patients and highlights the National DPP lifestyle change program as a treatment option. Color printing is recommended. 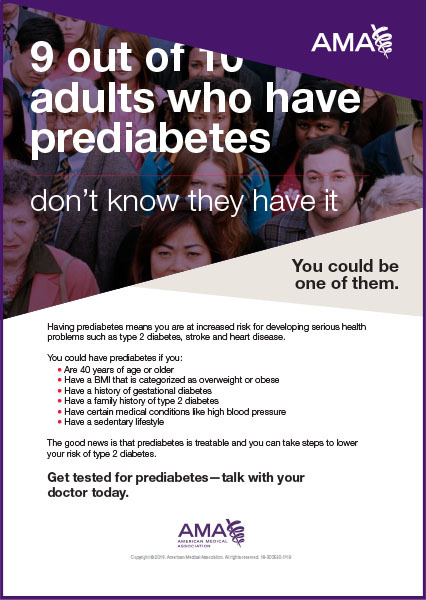 This poster spotlights the prevalence of prediabetes and associated risk factors. Color printing is recommended. This fact sheet summarizes a sampling of studies conducted on the National Diabetes Prevention Program lifestyle change program over the past 20 years. 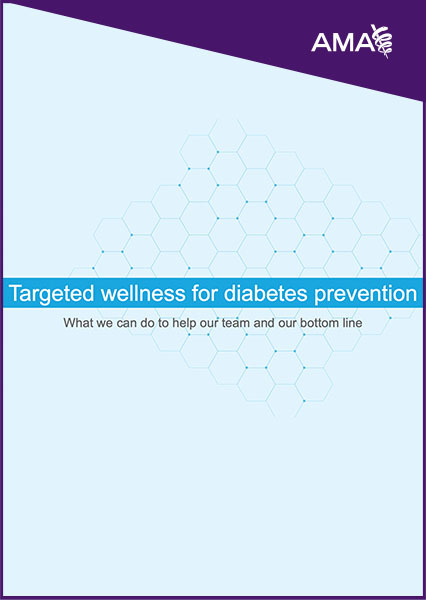 This customizable presentation has essential facts and figures that can be used to gain buy-in from internal stakeholders when making the case for diabetes prevention. 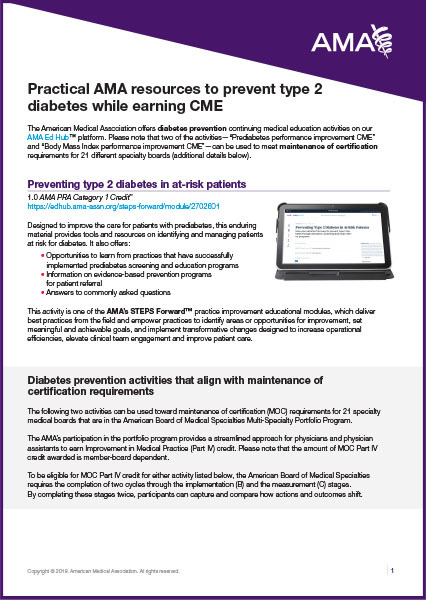 This resource outlines the Continuing Medical Education (CME) activities on diabetes prevention available through the AMA’s education platform, Ed Hub™. 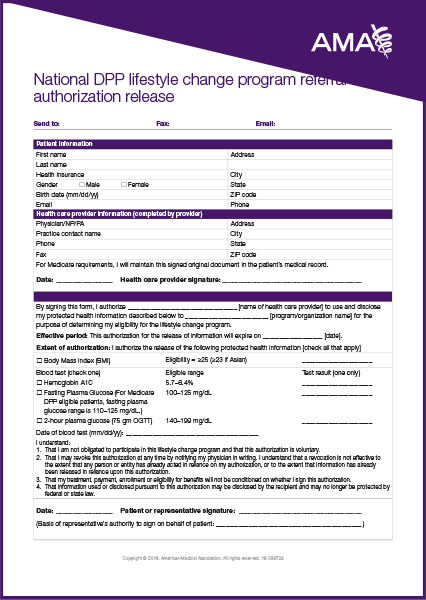 This form is used to refer eligible patients to a lifestyle change program. In addition, by completing the necessary fields, patients can give their permission for health care providers to use and disclose certain protected health information to determine the patient’s eligibility for the program.